I admit when I started selling these, I thought they were perfect for a baby gift. And they are! I still give one to each baby born in our family and spend the year filling it with letters. But these are SUPER first birthday gift ideas! I have so many customers that order before the birthday. Then set the time capsule out for everyone to write a letter to the baby at their first birthday. And its a great idea! Because by the time they are at their first birthday, you know who they are. You have funny stories of things that happened their first year. What an awesome gift to give to the "baby" when they are older. And believe me, they will appreciate it someday. Now my grandparents are gone, I treasury each letter and card from them. 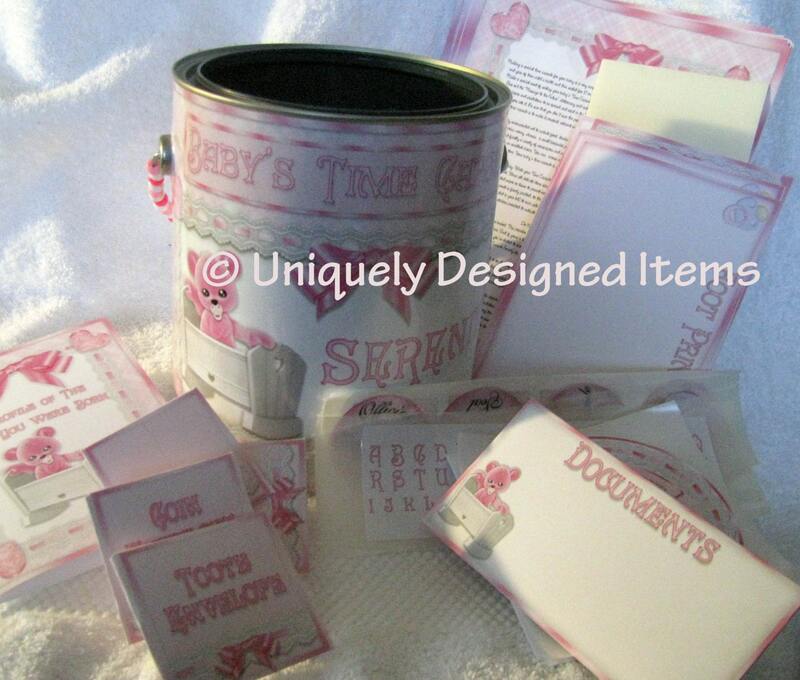 Try our custom baby time capsules! We have pink or blue. 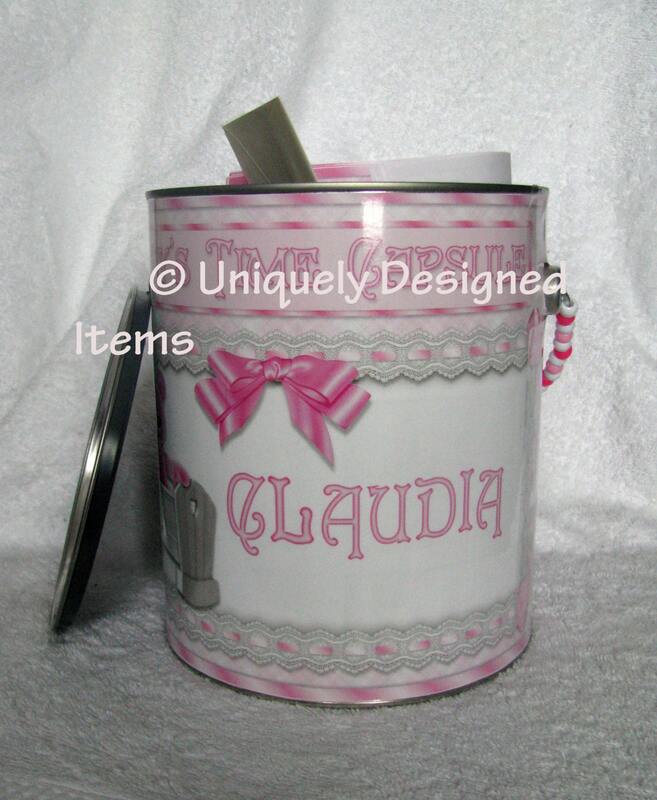 And can be customized for your baby (with their name and date). Each time capsule has: stationary for family members to write letters to baby on. 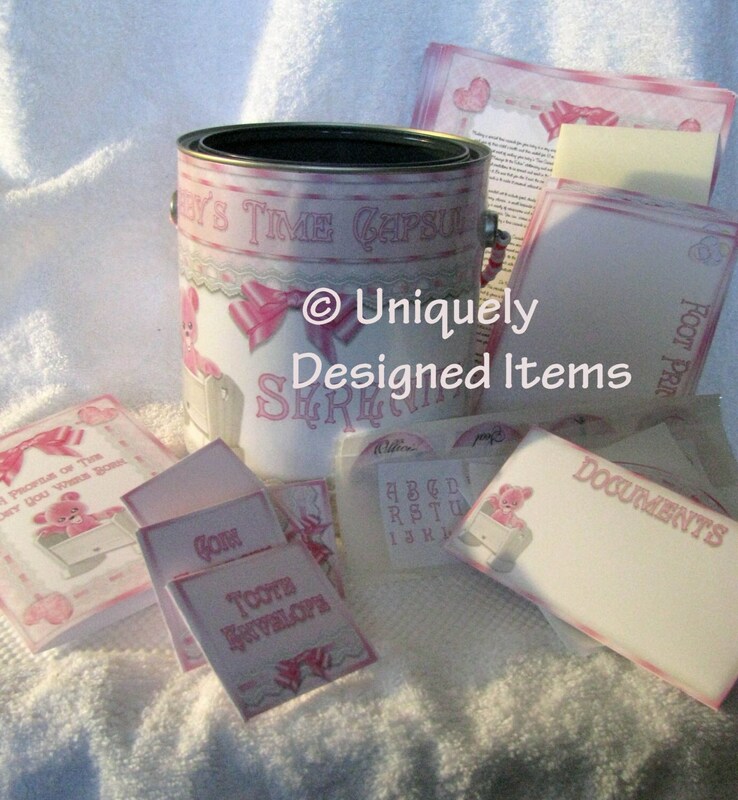 Custom envelopes for a tooth, stamps from the year baby was born (does NOT include stamps. coins or other items). Envelope for coins. Profile to fill out of the day baby was born (the weather, favorite TV shows and other information that baby might be interested in). It also comes with stickers and a blank DVD to put videos of baby for later. Time capsule comes with "official time capsule seals" so you can officially seal it if you want (or some parents just keep adding letters and items over the years). Note on the shipping: Please send me a note and I'll adjust the shipping to the exact amount. I have to use a big box and this is an estimated guess across the country. So if you live closer, it might be less. I'm not trying to cheat anyone. Its just hard to know! Just email me your zip code and I'll check it out. I love everything about the time capsule. We loved writing the personal letters to be opened when our granddaughter is older. This is the perfect, personal gift. Thank you Rebecca!! !